Due remembers all the things that you need so you don't have to. Because it repeatedly reminds you of things until you act on them, it‘s impossible to forget anything. 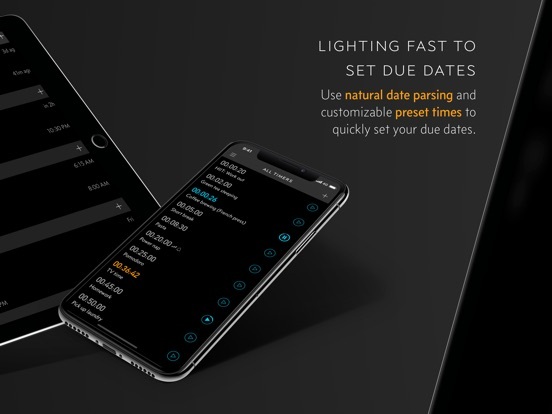 Most importantly, it's lightning-fast to set and postpone reminders, all thanks to a clever time picker and natural date parsing. 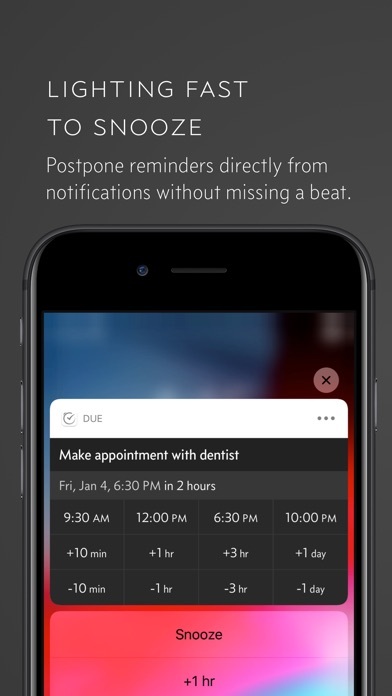 Auto Snooze repeatedly* notifies you of missed reminders until marked done or rescheduled. Choose between intervals of every 1, 5, 10, 15, 30 and 60 minutes. 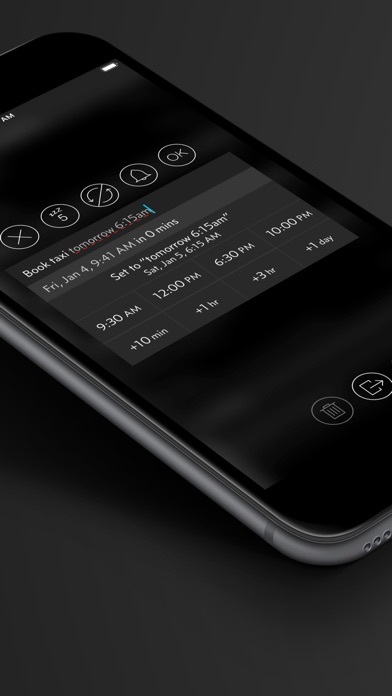 A time picker with 12 preset and fully customizable times lets you set due dates and postpone reminders in record time. 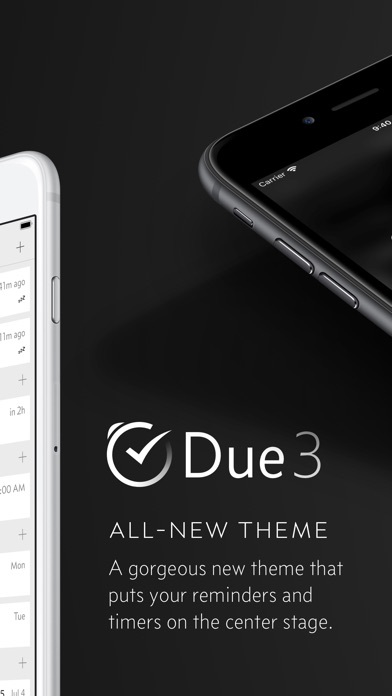 Due can also parse dates and times that you typed or dictate and offer to set the due dates and times for you. 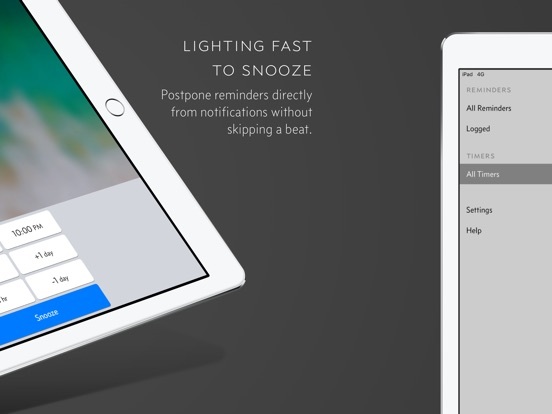 Use iCloud or Dropbox to keep your reminders and timers in sync across your iPhone, iPad and Mac. There is no account to sign up for. We don't store, and we can't access your reminders and timers. And you don't need internet to receive reminders. 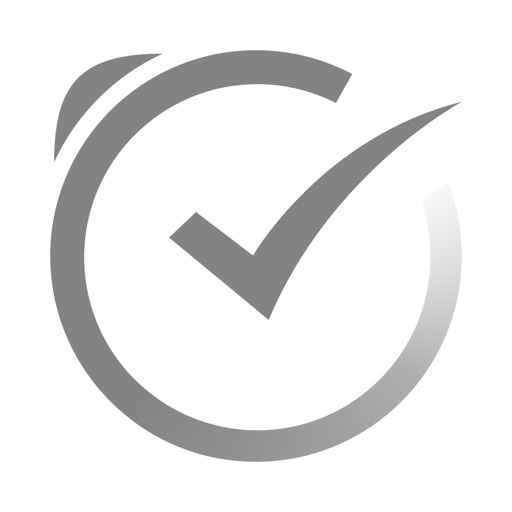 Automatically adjusts text size according to your system setting, and offers full VoiceOver support. 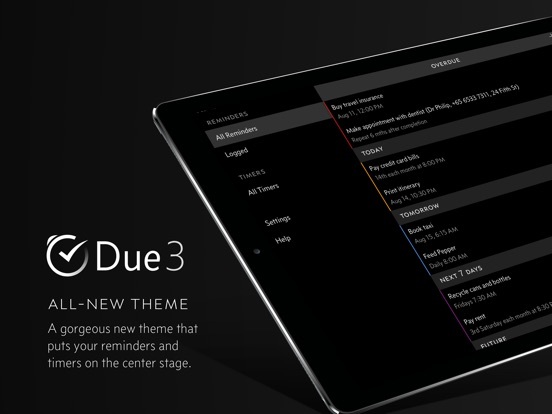 Due is also localized in 17 languages. WHAT'S THAT IN-APP PURCHASE ABOUT? If you purchase Due from version 3.0 onwards, there is *no* additional in-app purchase required. 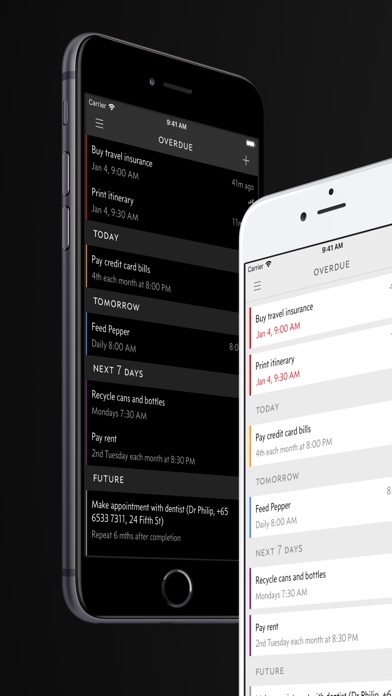 You get to use *everything* in the app, and all future 3.x features. That in-app purchase is meant for customers who have purchased Due before 3.0, and would like to unlock the extra goodies in 3.x at a discounted rate. Due requires an iPhone, iPod touch or iPad running iOS 10 or later. Happy new year! 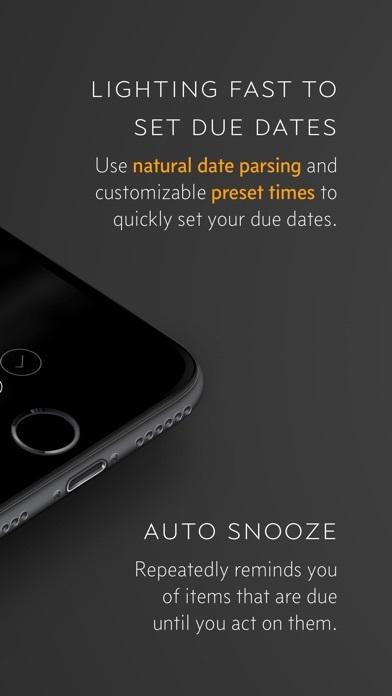 This update further improves on the experience of custom snooze. 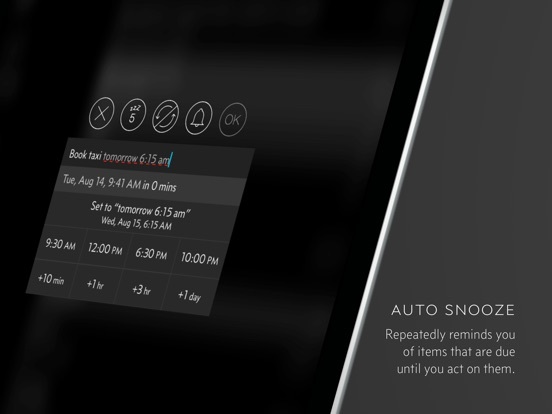 First, there's no need to tap on the "Snooze…" button to access your Quick Access Times; they now appear right within the notification. 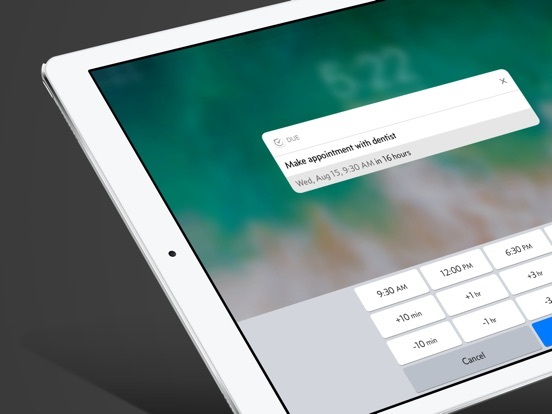 Next, custom snooze on the Apple Watch should also be more reliable, giving you the list of Quick Access Times instead of the standard text replies. There's also some improvement to URL schemes for the geeks out there. More to come!